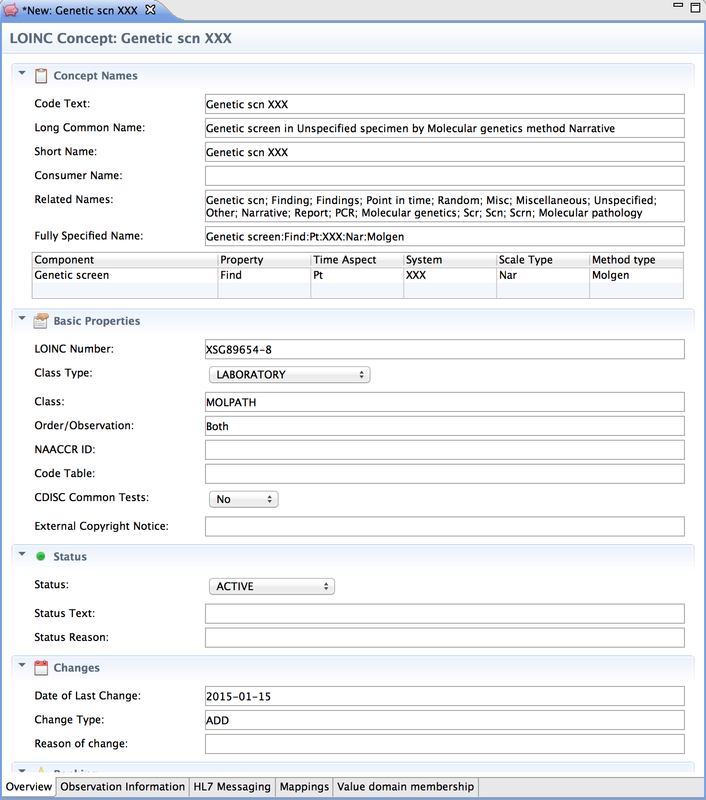 Snow Owl allows creating and modifying LOINC codes. Validation support during the editing process ensures that newly created codes conform with the guidelines. 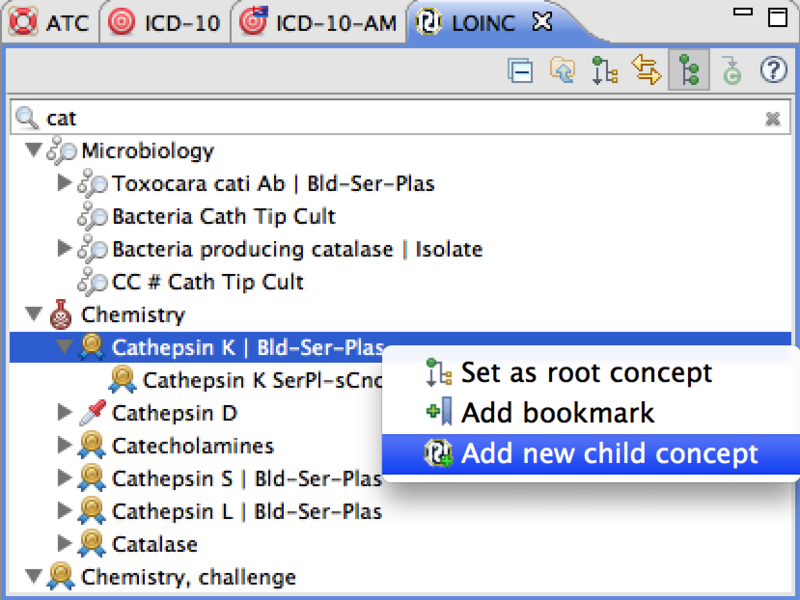 To create a new LOINC code, go to the LOINC navigator, right click the parent, and select Add new child concept. The information in the editor is copied from the parent code. This way, only differing information has to be entered. Entering information (e.g. Component, Property) in the table automatically updates the Fully Specified Name, which is a read-only text field. A unique LOINC number is created for the new code. Extension numbers start with an X, the other two letters indicate your extension (in our example XSG). The date of change is set to the current date, and change type is set to add. LOINC number, date and change type can't be edited. Once you are done editing, save your changes. The new LOINC code is now visible in the LOINC navigator and can also be found in searches. The code validation prevents you from authoring invalid codes, because errors have to be fixed before saving. If you enter an invalid value in the Ranking section, you will see a small error icon. Hover over the icon to get detailed information about the problem. Enter modifications in the text field. You can delete, overwrite or add text. LOINC number, Date of last change, and Change type can't be edited. To change the Fully Specified Name, enter modifications in the table below the text field. The modified code is now displayed in the LOINC view. 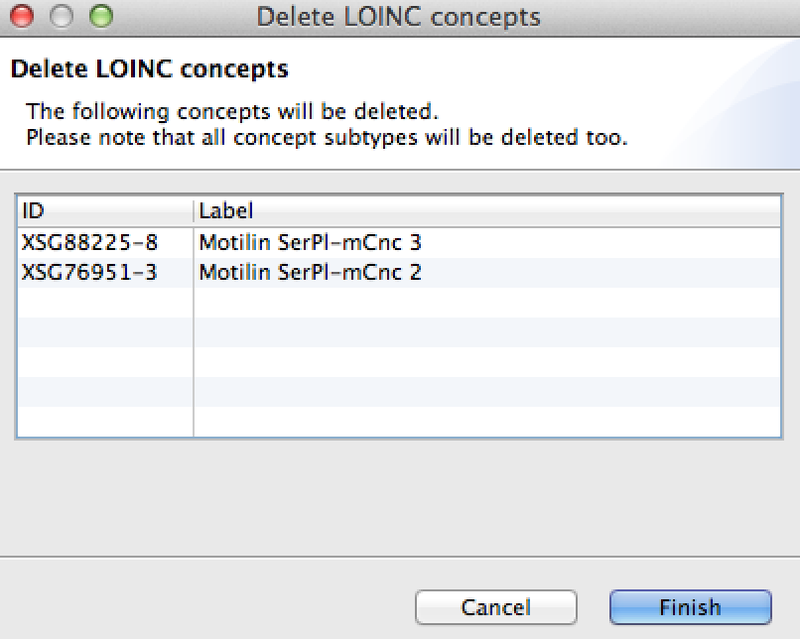 You can delete LOINC codes that are part of your extension by right-clicking the code in the LOINC view and selecting Delete concept. When deleting a code all subtypes will also be deleted. To avoid mistakes, you will be presented with a deletion plan. Click Finish to confirm the deletion, or Cancel to keep the code. The deleted code will be no longer displayed in the LOINC view.